Cooperstown, N.Y. - A rare grouping of paintings and sketches from American Impressionist masters will highlight the summer season at the Fenimore Art Museum in Cooperstown, New York. American Impressionism: Paintings of Light and Life, on view May 26 - September 16, will showcase groundbreaking artists including Childe Hassam,William Merritt Chase, Mary Cassatt, Theodore Robinson, John Henry Twachtman, and others. These adaptors of the French Impressionist style revolutionized the American art scene in the late 19th century and ultimately paved the way to a uniquely American style of painting. American Impressionism: Paintings of Light and Life features 26 paintings, dating from 1881 to 1942, representing nearly every noted American Impressionist from the period. "The paint, the color, and the light in these works separated them from anything that had been done in this country before," said Museum President and CEO, Dr. Paul S. D&apos;Ambrosio. "They can truly be called some of the first, modern American paintings." Impressionism was a painting style imported to America after the 1880s. The major catalyst was Paris-based art dealer Paul Durand-Ruel&apos;s 1886 exhibition of French Impressionist paintings in New York. Comprising nearly 300 paintings by Edgar Degas, Edouard Manet, Claude Monet, and others, the exhibition marked the beginning of serious interest in Impressionist art on behalf not only of American collectors, but also American painters. 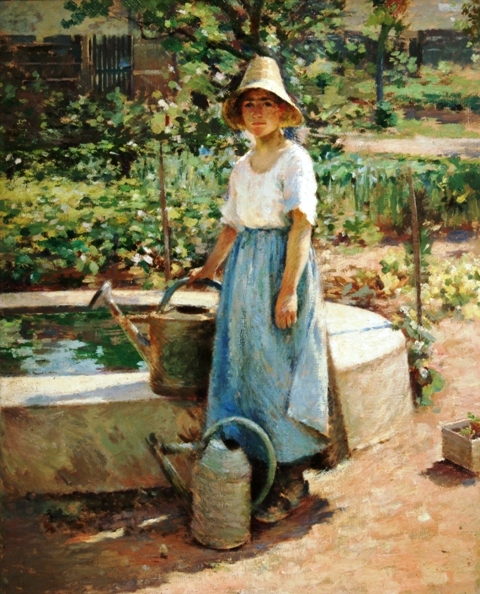 The artists represented in American Impressionism: Paintings of Light and Life were among the first generation of American painters to utilize the techniques of their French counterparts, such as a brighter palette and the use of broken brushwork. While using innovative techniques, they were traditional in their selection of subject matter, seeking out and painting colorful landscapes, beach scenes, urban views, and perspectives of small town life. The artists had a particular interest in the way light could be captured on canvas. "The Impressionists believed there was a lot more going on with the play of light on various surfaces than people realized, and that&apos;s what they wanted to express in their painting," D&apos;Ambrosio added. These works will be on loan from several sources, including The Arkell Museum (Canajoharie, NY), The Florence Griswold Museum (Old Lyme, CT), The Parrish Museum (Southampton, NY), and The Metropolitan Museum of Art (New York, NY). The exhibition will also feature Bridge at Dolceacqua (1884) by Claude Monet (Clark Art Institute, Williamstown, MA), an excellent example of French Impressionism that inspired and influenced these American artists. For more information about this exhibition, please visit FenimoreArtMuseum.org. American Impressionism: Paintings of Light and Life is sponsored in part by Fenimore Asset Management and Golden Artist Colors.